Anyone bought the voodoo knife block set? 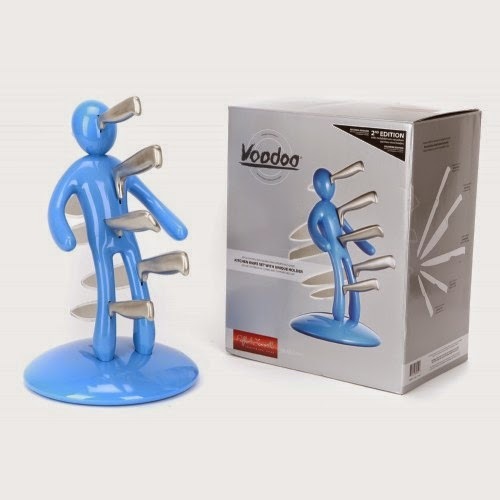 Home » Stainless Steel Knife » Anyone bought the voodoo knife block set? Is it worth the money? I don't want to spend all that if the knives are no good. Would anyone recommend it? I don't know about the knives, but I do like their "Ex" holder! Generally, stainless steel knives are difficult to sharpen because of the chromium added to the alloy. They are convenient for clean-up, though, and you never have to worry about rust as you do with high-carbon steel. If you can return the knives if you are unsatisfied with them, then go ahead and give them a try. If not, I'd suggest going to a reputable restaurant supply shop and buying one or two well-made, comfortable (in your grip) knives to start, then building your set as time and money allows.